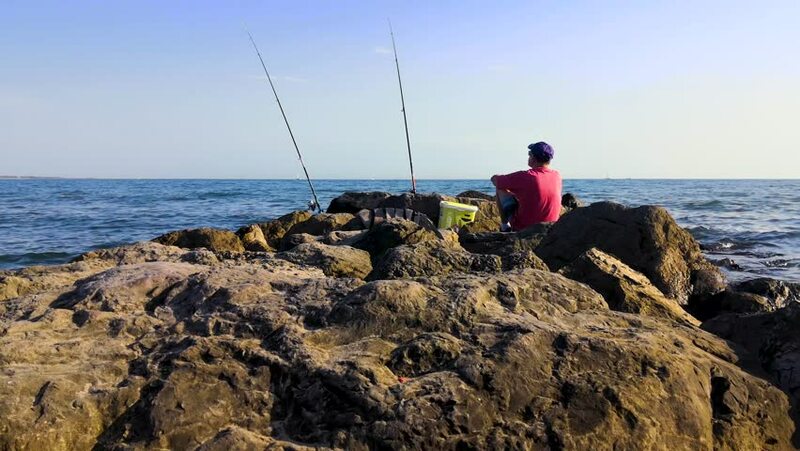 A fisherman with a red shirt and two fishing rods is patiently waiting for a fish to hook on his bait. He is sitting on a rock peninsula at the Mediterranean sea at the south of France. hd00:10A boy sits on the shore line, fishing. He patiently waits for a fish on his line. The sunsets glow is visible in the distance. Lake Powell is famously known for its fishing, marine sports and more. hd00:16BERDYANSK, UKRAINE - AUGUST 11, 2018: Unknown athletes are engaged kite boarding. Slow motion. hd00:18Fishermen catch fish in the Sea of Marmara. Ship comes up from the Bosphorus Strait. Turkey. Istanbul.